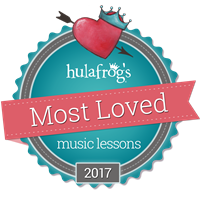 Proud to be voted Hulafrog's Most Loved Music Lessons for Southern Maine in 2017 and now, 2019 too! Woohoo! Pam Donkin featuring many CMN members and lottsa kids! Music classes for children birth-5 years and the adults who love them! See the schedule and register now! Find out more about the Music Together program and bring harmony home!